Mt. Huangshan is situated in southern Anhui Province, crossing Shexian, Yixian, Taiping and Xiuning counties. It was called Yishan Mountain in the Qin Dynasty and was given its present name in 747, the sixth year of the reign of Tang Emperor Tianbao. Covering an area of 154 square kilometers, the mountain is a good place to appreciate majestic peaks, grotesque rocks, towering pines, drifting clouds and clear mountain springs. Mt. Huangshan is famous for its four wonders of oddly-shaped pine trees, spectacular rocks, seas of clouds and crystal-clear mountain springs. Rare geological structure and fantastic peaks are noted features of Mt. Huangshan. Huangshan abounds in such resources as protophyte and wild animals. The coverage of forest in the area is 83.4 percent. It is home to 1,452 kinds of protophyle plants of 203 branches. 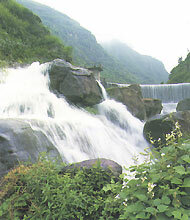 The mountain also has a rich cultural heritage. Geographic expert Xu Xiake of the Ming Dynasty visited the mountain twice, praising it in poetry, "There is no mountain as beautiful as Mt. Huangsham no other mountain under I feaven do I want to see after visiting Mt. Huangshan " Later it was heralded as "No mountain need be visited after visiting the five sacred mountains, none of the five sacred mountains need be visited after visiting Mt. Huangshan"